DownloadStudio is easy-to-use and has a well designed layout. All tools are integrated and contain full context-sensitive help. Click F1 on any screen and you will be able to read detailed explanations of what to do. 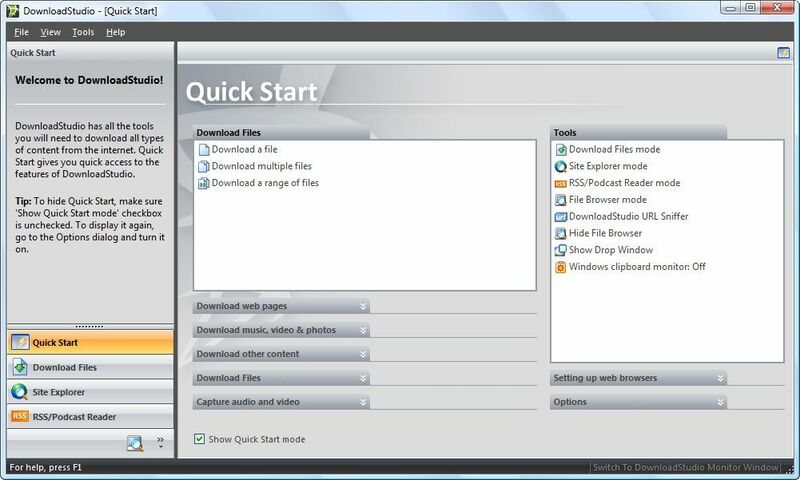 DownloadStudio also contains tutorials to teach you how to download files, download movies, download music, capture video, sniff URLs, and much more. 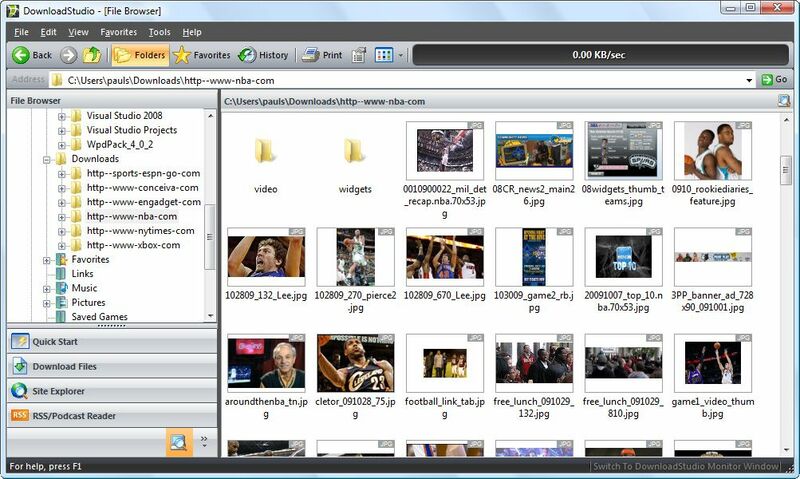 Click on the thumbnail images below to view full-sized screenshots of DownloadStudio. 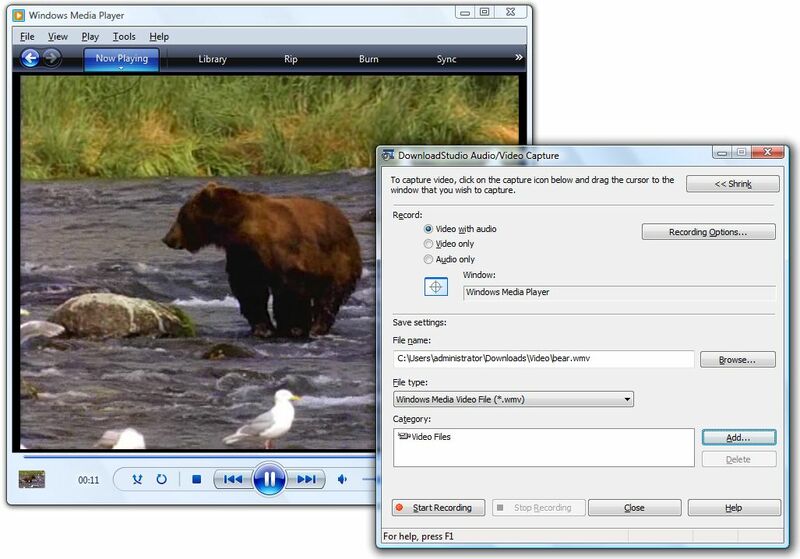 DownloadStudio - Download Files Window is your control center for all your downloads. All your downloads are listed in this window and they can be edited, resumed, re-started, scheduled, removed, opened, previewed and more. DownloadStudio can download all your favorite Flash Video (FLV) from web sites like Youtube, Megavideo, Dailymotion, Vimeo and more. 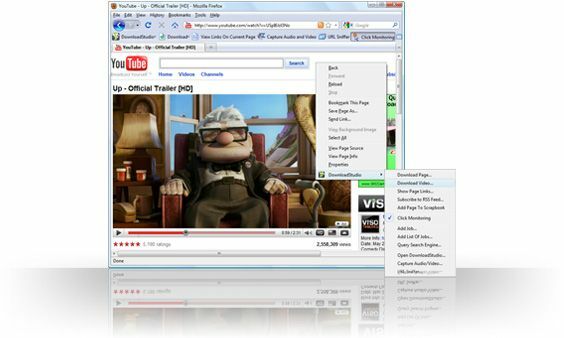 Simply right-click on a web page in your web browser and click the Download Video menu item. 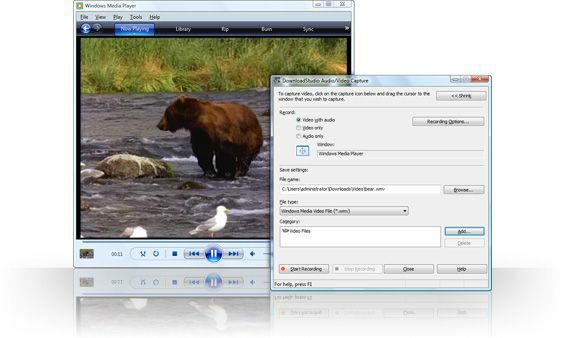 DownloadStudio Audio/Video Capture lets you record any audio or video as it plays in your web browser or media player. You can save it to your hard disk so that you can play it back later without accessing the internet. 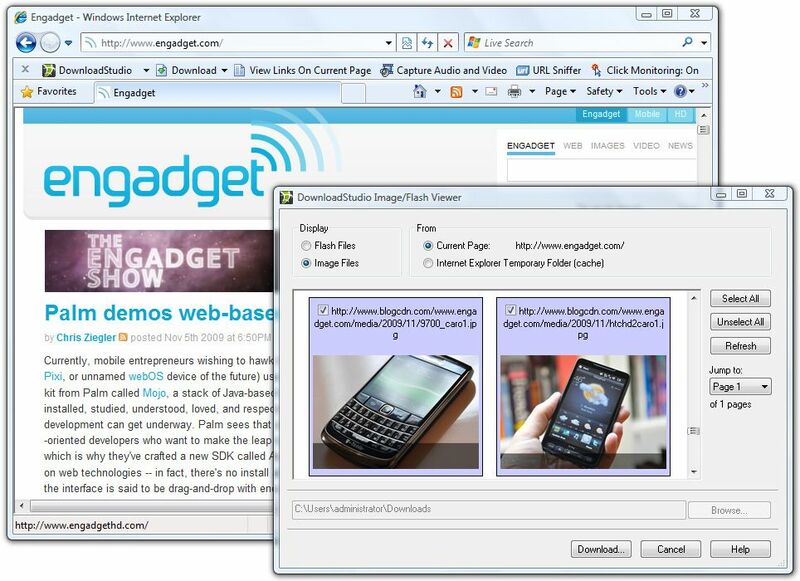 DownloadStudio works with all popular web browsers - including Internet Explorer, Firefox, Chrome, Flock, Mozilla and Netscape. 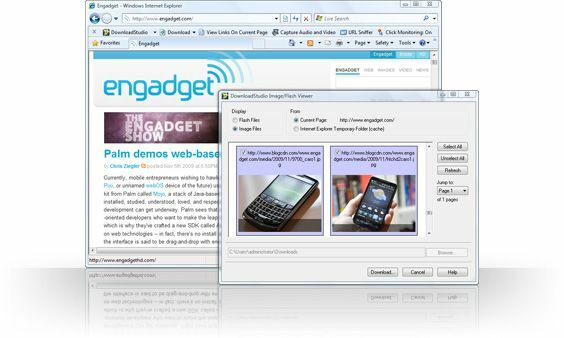 Features include a special download toolbar, right-click context menus, click monitoring, flash detection and saving, and drag-and-drop support. All features can be turned on/off. 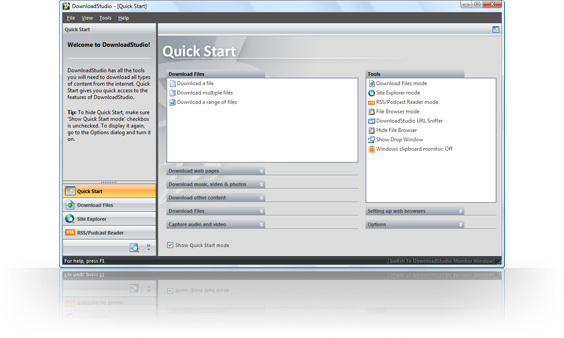 DownloadStudio - Quick Start Window gives you instant access to all tools and features of DownloadStudio. You can create new downloads, capture audio and video, configure your web browser and access all other tools in DownloadStudio. DownloadStudio URL Sniffer lets you watch your computer's network and internet connection and catch any URLs that pass through internet traffic. This is a very useful way to find 'hard-to-get' URLs such as those from your media player when it plays movies and music. 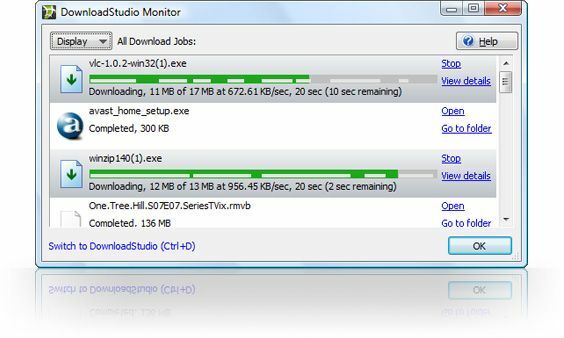 DownloadStudio Monitor window is a compact, easy-to-read window that tells you key information about all your downloads. If you find the DownloadStudio main window too complex, you can switch to this window at anytime by pressing the CTRL+D keys. 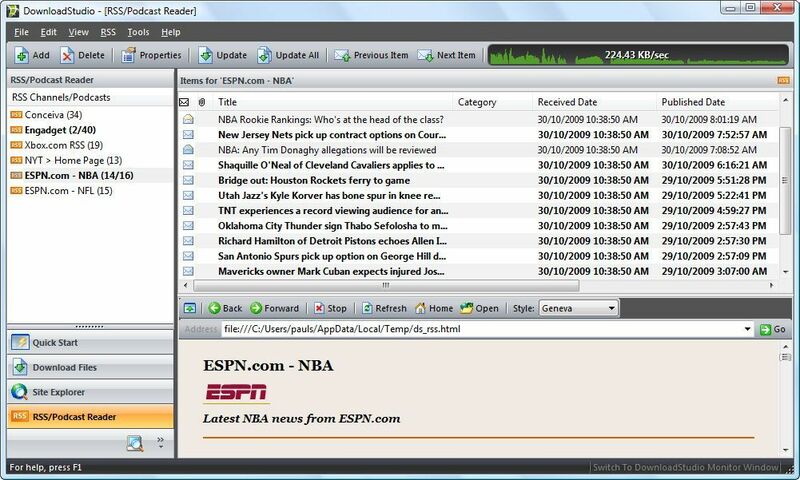 DownloadStudio - RSS/Podcast Reader Window lets you view all your favorite RSS feeds, blogs and podcasts. You can create, edit, view and manage all your feeds. You can also check each feed for any updates and download all links within feeds for complete offline viewing. 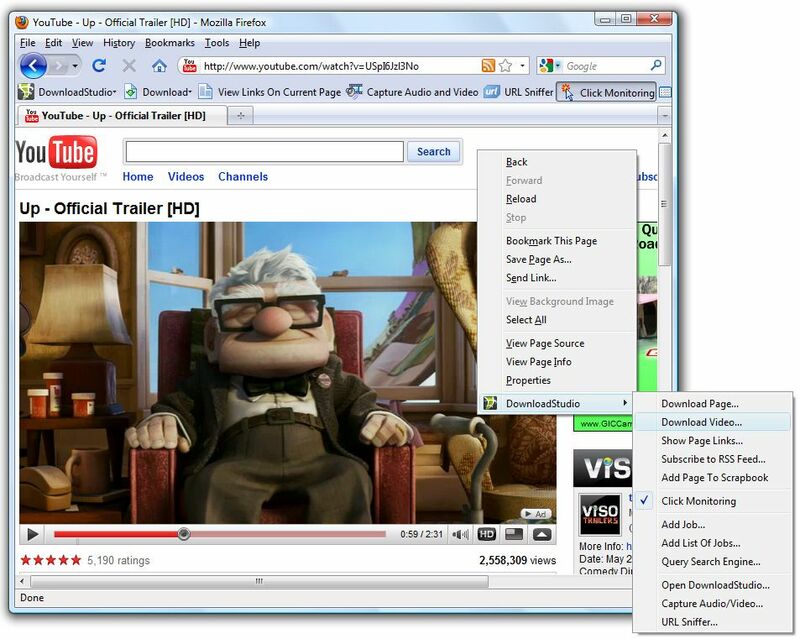 DownloadStudio - Site Explorer Window lets you browse internet web sites and FTP sites and view all the links and images contained on a site. This is very useful for finding links and files to download. 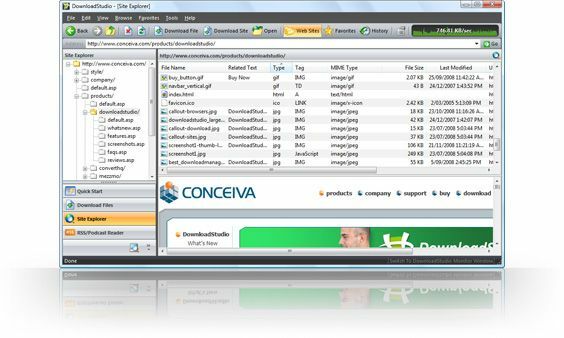 DownloadStudio - File Browser Window allows you to browse all the files on your computer. File Browser Window is just like Windows Explorer - except that it is able to thumbnail over 150 file formats and has a built-in Instant Viewer.